When Winthrop College opened in 1895, First Presbyterian Church Rock Hill realized that the time would soon come when it would be necessary to have a new church in the rapidly growing Oakland section of Rock Hill. This new church was to be organized “not as a secession; not as a competitor but a new organization - the two to work in harmony for a common end - the good of the community.” Thus Oakland Avenue Presbyterian Church (OAPC) was built adjacent to Winthrop to be a place where Winthrop students could find a church home. The first service at OAPC was held on December 1, 1912. 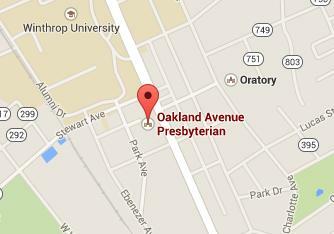 Oakland Ave. Presbyterian Church was formally organized on Sept. 14, 1913, with 181 members, all of whom united with the church from our sending church. Today OAPC is a thriving PC(USA) congregation of about 800 members. All are welcome to join us as we strive to Love God and Love Neighbor. Driving directions to Oakland Avenue Presbyterian Church, click here to find Maps and Directions. The Session This is the governing body of our congregation and consists of the installed Pastors and twenty four elders elected by the congregation. Each Elder serves a three-year term. View this link for the Elders currently serving on the Session and their Committee/Session Assignments. The Board of Deacons consists of twenty-one Deacons elected by the congregation, each Deacon leads one of our DeaconCare Groups and serves a three-year term. Officers for 2019-2021 -- Click here for their biographies.